The Model 4012 VFTLP+™ test system was developed in early 2000 to add high speed measurements to the usual I-V plot, to measure and record the real TDDB waveform which causes oxide failure. Accurate measurements of this waveform have finally been identified by Barth Electronics Inc. and CDM protection can now be based on known dimensional design parameters. We identify the response of your CDM protection circuits with 100ps risetime pulses which simulate the real CDM test. 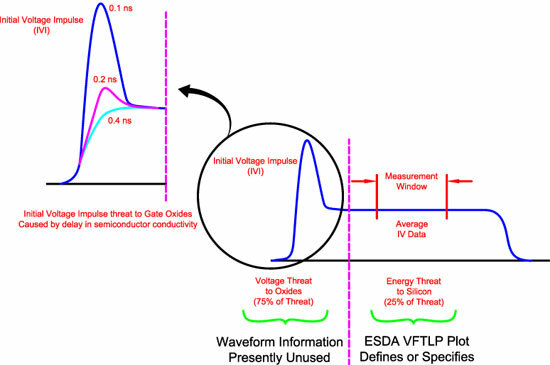 This is the only way with which to provide the total gate oxide threat voltage data. Why the Plus(+) in VFTLP+™? Model 4012 VFTLP+ specifications in printable PDF format. Current list of companies using the Mode 4012 VFTLP+ test system. Information on Model 4012 VFTLP+&#8482 device testing.